Canadian Organic Maple Co. Ltd., is pleased to be able to produce 100% Organic Maple Syrup. 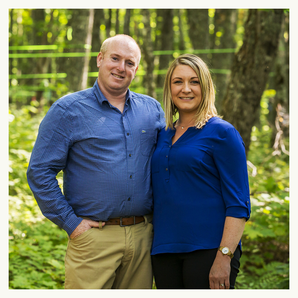 Our family-run sugary is located in the heart of the Appalachian Hardwood Forest in New Brunswick, Canada, at a place called Divide; so called because this location divides the watershed between two of New Brunswick's greatest rivers, the beautiful St. John River and the mighty Miramichi River. More specifically, we are situated approximately one and a half hours drive from the United States border crossing at Bridgewater, Maine. Canadian Organic Maple Co. Ltd. is organically certified by Ecocert, which means we must adhere to and follow strict organic certification guidelines. These certifications meet organic requirements virtually worldwide. We are also licensed by the Canadian Food Inspection Agency. As you are no doubt aware, there is growing awareness of the use of paraformaldehyde in many established sugaries. Our sugary has maintained organic certification since our start in 2000. 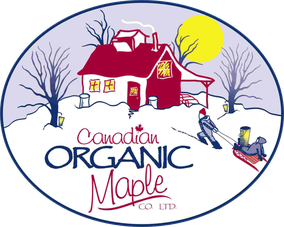 Our organic certification is your guarantee that Canadian Organic Maple Co. Ltd. is 100% environmentally friendly and does not use paraformaldehyde and that we follow the best, most current practices to produce 100% pure and natural maple syrup products. Our sugary consists of approximately 120,000 taps nestled in a natural and pristine forest. We offer a full range of maple products and we also package the late run syrup in 4 litre containers for maple cleanse customers. Owners, Gus and Sandra Hargrove, have been active in creating "Green Products" that use renewable resources and are environmentally friendly, for many years. Sandra has been involved in the production of all natural products since she opened Bath Springs in 1998. Under the Bath Springs name, she sells a wide variety of personal care as well as specialty items made from high quality, natural ingredients. Gus has an engineering background and has been involved in micro hydro, power production and firewalls since 1978. He has been involved with maple production his entire life, starting with his parents operating a small sugary from which they "peddled their maple syrup in town”. This is his first foray into large scale production, however they are pleased to provide you with "old-style" quality. Their goal has been to give back to the area by providing a business that would provide good year round employment. 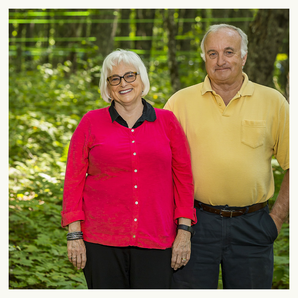 Their Son Zak and daughter-in-law Karen are also active in Canadian Organic Maple. Karen manages the office. Zak has an engineering background. Zak and Gus have worked in food plants and large industrial sites. This experience has allowed Canadian Organic Maple to stay ahead of the curve, increasing efficiency and reducing our carbon footprint. Storing Maple syrup: The Canadian Organic Maple bottle of Maple syrup is sealed according to set standards and should be stored unopened in a cool, dry place. Once opened, Maple syrup should be refrigerated where it will keep for up to 6 months. A freezer is the ideal spot for long-term storage of Maple syrup. Due to its high sugar content it will not harden in the freezer and can keep indefinitely. Alternating daily cycles of night freezes and warm days are necessary for sap flow. Maple syrup shrinks slightly as it cools. ¼ cup of Maple syrup contains more potassium than a banana. There is not a continuous flow of sap throughout the maple season. The flow actually starts and stops depending on daytime and night time temperatures. The ideal conditions for sap flow are slightly above freezing during the day and slightly below freezing during the night. The sap flow also fluctuates based on what portion of the Maple syrup season it is. Early and late season the sap flow is low, with higher flow rates around the middle of the season.